It's far too soon to tell what form mind-numbingly fast quantum computers will take, but a good bet is they'll end up resembling today's integrated circuits. One experiment in using superconducting circuits has produced a linked pair of quantum bits. 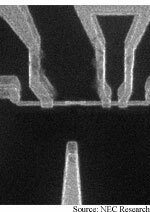 This not-so-simple feat gives a big boost to the chip-based approach to quantum computers. Much cheaper solar energy could be on the way thanks to a solar cell that uses separate components to absorb light and to harvest electrons. Ordinary solar cells use silicon to do both. Separating the functions means you can use a much cheaper semiconductor. The trick is getting electrons to fly straight and true. One of the oldest interfaces combined with a decades-old technology makes one of the newest media easier to use. Adding barcodes to printed transcripts turns out to be a good way to search digital video on handheld computers. Moving individual atoms around means being able to isolate a single atom, then place it with atomic precision. A chip-based positioner promises to let researchers practice atomic positioning using pocket-size equipment. The device could also play a key role in next-generation, ultrahigh-capacity data storage. Warping yields better light chip... Supersensitive disk drives on tap... Lasers tweeze every which way... RNA forms nanomotor... Cold logic promises speedy devices... Net has few degrees of separation.